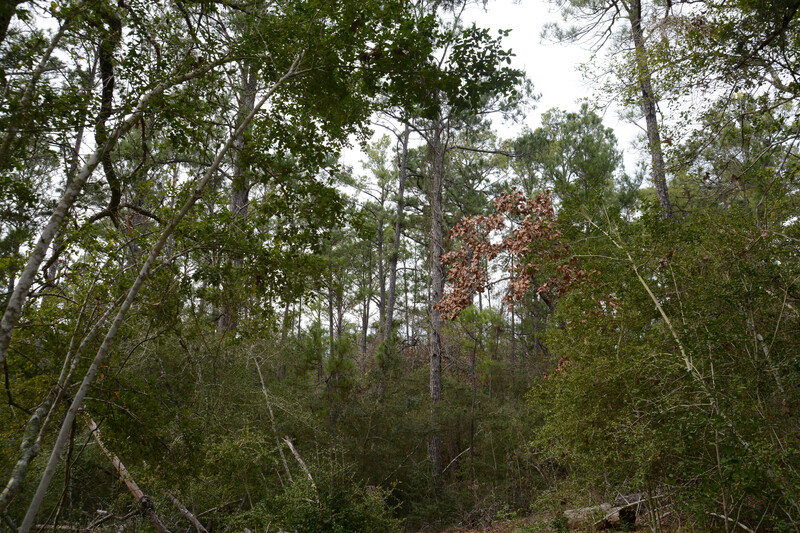 With no special plans for Christmas Day, I decided that I would take a walk at Bastrop State Park, the scene of a horrific wildfire that started September 14, 2011 and was finally controlled on October 10, 2011. Almost 35,000 acres were burned which included a large amount of the Bastrop State Park and the Piney Woods. Today, seven years later, the State Park is slowly coming back to life as Nature readjusts following the blaze. With the help of many volunteers, thousands of Loblolly Pines have been replanted to replace those lost in the fire and are growing very nicely. Many are already well over ten to fifteen feet tall bringing much needed greenery to the burned areas. Courtesy of Texas Parks and Wildlife. This was the first time that I have gone to this park with the intentions of taking a walk. As it was Christmas Day, the Park Office was closed but they have a handy self payment service along with a plentiful supply of maps that mark the trails. I pulled over on the side of the road to study the map when a young female Park Ranger pulled up alongside of me. Wth her help, I was able to decide which trails I wanted to hike and set off along Park Road 1A to the middle parking lot. All of the trails are designated a color and I was planning on hiking the Post Oak Spur (Gray Trail) then taking the Scenic Overlook (Red Trail). I successfully made it to what I thought I was the scenic overlook but instead, there were a bunch of cabins. Along the way, I ran into a couple of older people who were out for a stroll. I stopped to chat with them and they introduced themselves as Patricia and Hector and they were from Corpus Christi and up for the weekend. We chatted for a bit before I pushed on. I backtracked and then turned off on another Red Trail and finally ended up at the top of the hill. This was quite obviously not the Scenic Overlook so somewhere, I had taken a wrong turn. Not to be deterred, I set off back down Park Road 1A or at least what I thought was this road. After travelling about a half mile with a view of the road in front of me, I was getting concerned that I was going in the wrong direction. Rounding the next bend, Park Road 1A was blocked off as the road had completely washed out on the other side of the barricades. It also changed into Park Road 1C at this point. Being the stubborn old fool that I am, I climbed down the bank and crossed the stream at the bottom and continued for a bit walking on Park Road 1A enjoying the walk even though it was quite obvious by now that I was totally lost. At that point, I came to the conclusion that I was heading in the wrong direction and there was nothing else for it but to retrace my steps. So, I turned around and headed back climbing back down into the gully to get up to the road on the other side and headed back to the top of the hill where I had originally come out. It was all good exercise and easy walking except for the uphill parts. There was nothing else but to retrace my steps and backtrack along the trails that I had taken to arrive at this point so without further ado, I started to walk back down the Red Trail. I ran into a young couple with a young daughter and they asked me for directions. I jokingly told them they were asking the wrong person as I was just as confused as they were. They continued on as did I in opposite directions and then the trail I was on turned into something else so I had to backtrack once again. We crossed paths again and they were able to direct me to the Grey Trail which they had just found. Continuing on, I met another young couple with a dog and we exchanged hello’s as we passed. After what seemed like walking forever, I came back out onto Park Road 1A opposite my truck which was a sight for sore eyes and a tired body. Altogether, I covered six and a half miles with probably at least a couple of miles being lost. The walking was easy and the trails were great. After a while, even though I was surrounded by the remnants of the forest fires with the gaunt spectres of burnt trees pointing up to the sky, it became the norm. The newly planted Loblolly Pines were a beautiful green contrast to both the burned trees and Natures own winter colors and it was great to be outside. I managed to get a picture of a Chipping Sparrow. Hard to believe that this…. I couldn’t resist taking this picture as it clearly shows the heart of this tree. Whereas this one is the future of the forest. All in all, for me, it was a great way to spend Christmas Day enjoying the gifts of Nature. The video below is made up of the many pictures that I took. I decided at the last minute that I would drive to Buescher State Park in Smithville to see how the Park was recovering after the devastating fires from a few years ago, 2011 to be exact. The plan was to go in the Park entrance and then take Park Road 1C back through to Bastrop State Park as I hadn’t planned to hike any of the trails. I turned off HWY 71 where the sign pointed to the Park and arrived at the Park gate only to see that it was barricaded off with another sign indicating that I should follow the Detour instead. I turned around and then followed the Detour which I figured would bring me back into the park from the back end, so to speak. There are several roads that lead into the park that have private residences so not all accesses are controlled. I drove around for a bit just checking things out. The Park was pretty quiet as far as visitors go with a few cars parked at the cabins. I drove to the lake and looked around but it too was very quiet and I couldn’t see any bird life at all. I decide to take Park Road 1C and head towards Bastrop State Park and then stopped at the two overlooks located along the way. The picture at the top of the page is a pano of 10 separate pictures joined together. It truly is a wonderful view. The picture below is a single picture taken from the first overlook. Continuing along Park Road 1C, I noticed that the flowers were out in abundance and then as I turned another corner, came across a road washout which completely prevented me from continuing towards Bastrop State Park. I am not sure when this washout occurred but it must have been very recently as no attempt had been made to make any repairs. I turned the car around and then walked back to take a few pictures mostly of the wild flowers. I had no choice other than to backtrack and head out of the Park off one of the other roads which was no problem. It looks like the Park is coming back to life and there is a lot of new vegetation and young trees growing. Even the Loblolly Pines that were planted just after the burn are beginning to grow back. Nature is a pretty wonderful thing and has remarkable powers of recovery and even takes the opportunity to wield her magic brush and paint a different picture than was there before. I originally meant to hike the Bastrop State Park but arrived late in the afternoon and opted to just drive around the park to see what wonders it might hold. It is a very sad sight to see the beautiful pines mostly gone in the wildfire of 2011 and it made me feel very depressed as the view didn’t change. Miles and miles of charred trees standing like ghost statues as mementos to the fire. I was able to drive around the loop for free as long as I didn’t get out of my car and I was under a time limit given me by the Park Ranger. I had no intention of doing anything except to view the damage but I did discover that I could drive on to Buescher State Park on Park Road 1-c. I completed the loop and then took the road to Buescher Park, a distance of 11 miles. On the way, I ran out of the fire desolation and the trees and greenery were again abundant with a lot of the Pine trees mixed in with the others. I noticed a couple of trail heads among all of this greenery marking the trails that ran through the area.True to its word, the road ran right into the Buescher Park and on the way out, I stopped at the Guard Station and picked up a couple of maps and then drove home and made plans to visit the Buescher Park instead on a different day. Two days later found me driving towards Smithville and back to the Park the entrance of which is off Highway 153 just outside of Smithville. For a nominal fee of 4 dollars and after a couple of questions to the Park Ranger, I hopped back into my car and headed back up Park Road 1-c to the first trail head marked on the map. Pulling into the parking area, the first thing I noticed was the marvellous view from the overlook that was the parking area. In the far distance, I could see the burned trees standing like statues on top of the hill, several miles away. I opted to walk a 5 mile loop that led me up one side of Park Road 1-c and the after crossing the road, back down to my starting point coming out at the Virginia Harris Cockrell Cancer Research Center at Science Park, just across the road from the parking lot. It was a great day to be walking and I passed a few others who obviously had drawn the same conclusion. The hike was a mix of scenery but was nearly always under the shade of trees of different varieties. The trail was not a bit difficult and the surface changed from red rock, to pebble stones and then to plain old dirt as I changed elevations. There were a couple of new bridges and at one point a sign warning of a dangerous curve ahead. The trail is open to bikers but it did not appear that it was used by too many. I didn’t see a single one and there were no signs underfoot that any had passed recently. The recent rains had filled the very small stream in one of the gullies but it was really not much more than a ditch and presented no difficulties. From a photographic point of view, there is a lot of monotony in the scenery and it was difficult to get much variety in the pictures. I spent a couple of hours and took well over 100 pictures some of which are shown below. There is one whimsical picture of little stacks of rocks that some enterprising, and probably young person, had taken the time to build.The class I recently attended at Precision Camera has helped me tremendously in getting things in focus and making better choices of subjects. On the way home, I was drawn by a beautiful sunset and just had to stop the car to take a couple of pictures. I plan on going back to Buescher State Park in a couple of days to hike the long trail.